Fermé du 2 au 24 août 2014. Veramente eccezionale, ingredienti di qualità assoluta e personale veramente gentile! Ci torneremo senza esitare, una vera fortuna averlo sotto casa! Food & staff were outstanding! This place is fantastic! Our large group of 8 had an array of burgers: cheddar, Parisian, French, Cajun, as well as the chicken skewers. The meat was beyond tender and succulent. It’s was like biting on a pillow. And the service is some of the most hospitable and energetic I have ever experienced. Service is very fast, too! Cheers to Nicholas and co. from the San Francisco crew! Very friendly environment. The tartar was interesting if you are feeling adventurous and the burger was delicious! Amazing ❤️ But not really for me I’m sure you will like it if casual and cozy is your thing! Friendly atmosphere, wonderful food. Definitely not ordinary burgers! Really enjoyed our evening. Fabulous burgers and very friendly service! Absolutely amazing food. No hype, no exaggeration, best burger I have ever eaten. We walked 10km to get there from our hotel and it was worth every step. Eat. There. Now! Absolutely delicious! 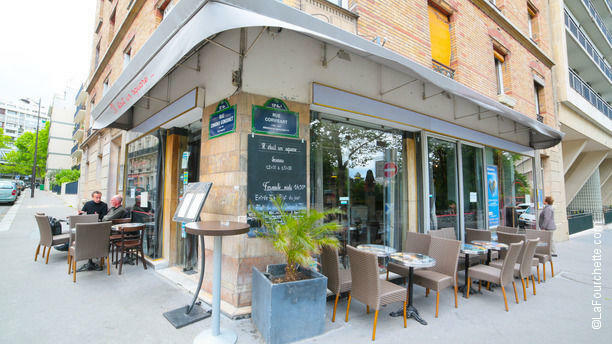 One of our best meals in Paris and one of the most affordable! The staff was very friendly, asking where we're from and making small talk while going over the menu. I do recommend making reservations, as it's a small place. Really good burgers and tartar! The desserts were very tasty as well! The staff was friendly! We were very pleased with everything! Friendly staff, international public, great food! loved the steak hache! reasonable prices! Wish Paris had more restaurants like these! Very good quality and a friendly team go in this location hand in hand.